For more details on these components, please review the Project Information tab. Join us at our public drop-in event to learn more about the designs, speak with the project team and provide your feedback. Location: Mary McCormick Recreation Centre, 66 Sheridan Ave. The content posted below will be presented at the drop-in event on April 8. Peel Ave. and Gladstone Ave. were last reconstructed in 1949. The average lifespan of a road is usually 50 years or so, at which time the road needs to be reconstructed. In 2011, the City eliminated the Dufferin Street “jog” by constructing an underpass on Dufferin Street to connect to Queen Street West (creation of a continuous connection for motor vehicles, bikes and pedestrian traffic on Duffering Street under the rail corridor). 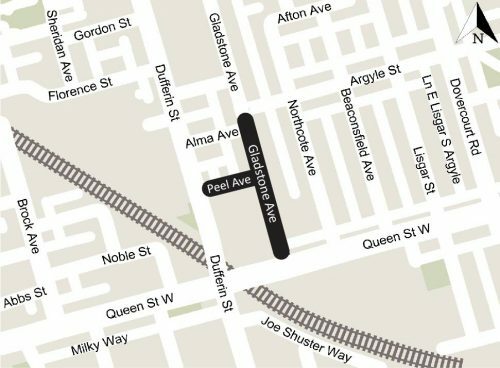 This connection eliminated the need for vehicles to travel along Peel and Gladstone Avenues to get to Queen Street West. As a result, there has been significant reductions in motor vehicle traffic and an increase in cycling on Peel and Gladstone Avenues. Detailed design has commenced. The City is now moving forward with changes approved through the 2010 Peel-Gladstone Reconstruction Environmental Assessment Study to convert Peel Avenue and Gladstone Avenue (from Minowan Miikan Lane to Peel Avenue) into a one-way operation for motor vehicle traffic. Pedestrians and cyclists will be able to travel in both directions. Two-way motor vehicle travel on Gladstone Avenue from Queen Street West to Minowan Miikan Lane will remain. Construction is planned for 2020, pending finalization of detailed design.